The Assembly of Nova Scotia Mi'kmaq Chiefs said the spill raises questions about the protection of the lands and waters. HALIFAX -- First Nations and environmental activists say they're "extremely concerned" after drilling fluids were spilled off the coast of Nova Scotia during a BP Canada oil exploration project. The incident came just two months after the province's offshore petroleum regulator granted the energy giant permission to drill the Aspy D-11 exploration well approximately 330 kilometres off the coast of Halifax. In a release issued Saturday, the Assembly of Nova Scotia Mi'kmaq Chiefs said the incident raises questions about the protection of the lands and waters, as well as any potential species affected by the spill. "We want answers from BP Canada," said Chief Terrance Paul, Fisheries Lead for the assembly. "We want to know how this could happen, what affect it could potentially have on our fisheries and what they are going to do to address that. Incidents like this are unacceptable in Mi'kma'ki." The assembly said that spills and environmental damage have been a source of constant concern for them, saying that they consistently advocate for protections to be put in place with any project of this nature happening in Nova Scotia. The Canada-Nova Scotia Offshore Petroleum Board said in an incident report Friday that there was an "unauthorized discharge" of about 136 cubic metres of synthetic drilling mud -- a heavy, dense fluid used to lubricate the drill pipe and regulate reservoir pressure -- from the West Aquarius drilling unit before it was stopped. They said an early investigation indicates the spill occurred in piping about 30 metres below sea level. 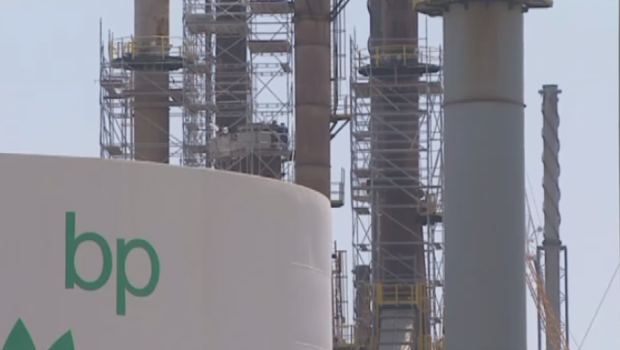 Anita Perry, regional manager of BP Canada, said Friday that her company "takes this incident very seriously and will continue with the investigation to understand the cause." In the meantime, CSNOPB said the exploration well is secure and drilling has been suspended while the cause of the leak is being investigated. The Council of Canadians, which has long opposed the project, held a rally Saturday afternoon outside the Prime Minister's Office to create a mock oil spill on its steps and demand a permanent end to BP Canada's offshore drilling in Nova Scotia. Robin Tress, an organizer with the group, said the risk assessments ahead of the project were not thorough enough, and the fact that the incident occurred so soon after the project began -- and before any oil was found -- demonstrates the riskiness of offshore drilling. "BP has proven itself to be a company that we cannot trust with our oceans," she said. "Deeper than that, this proves that our government is untrustworthy at stewarding our oceans and protecting us from the risk of offshore drilling." In April, shortly after the drilling project was approved, federal Environment Minister Catherine McKenna defended BP Canada's plans to commence drilling, saying: "The BP project went through an environmental assessment and has strict conditions. ... We're going to be monitoring it closely." At the time, Perry had also told The Canadian Press that the company was put through a lengthy and rigorous application process, and they were "confident we addressed all issues and risks for a safe drilling program." The spill also caught the attention of federal Green party Leader Elizabeth May, who tweeted that CNSOPB was minimizing the toxicity of drilling mud. "It is not 'mud.' It is an industrial mix with a lot of metals and toxics," she wrote. "But CNSOPB has a mandate to promote oil and gas." The Aspy D-11 exploration well is the first in BP Canada's Scotian Basin Exploration Project, which could see up to seven exploration wells drilled off the southeast coast of Nova Scotia over a three-year period.